When we think about the fight for racial and economic justice, food doesn’t always surface to the top of the list of things to tackle. But it should! In fact, food insecurity is a key contributor to health disparities. And folks who experience food insecurity are often people with low-income and people of color. Since access to healthy food can influence mental and physical health, job security, and educational outcomes, it’s clear this is something we’ve got to overcome. You can play an important role in fighting food insecurity in your own community. To help you get oriented in the food maze, here are a couple of working definitions and some how-to inspiration, courtesy of five ioby Leaders who have made it their business to improve the food scene where they live. That’s right! 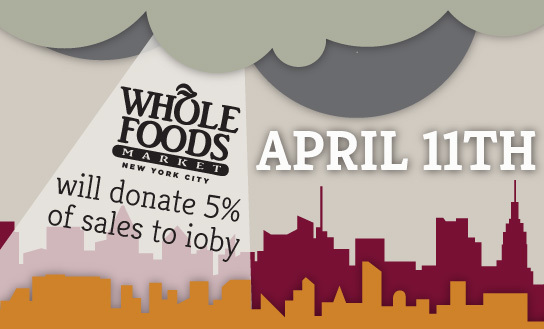 All day today, all New York City Whole Foods stores are donating 5% of sales to ioby! We’re so excited about this great partnership for healthier communities, we could shout it from the rooftops and we would love for you to join us. So, stock up on groceries and know that 5% of your Brussels sprouts and sriracha are going to ioby. Swing by the ioby table in store at all NYC locations, and say hello to our friendly volunteers. And be sure to tell your friends all about this great opportunity to make a big difference for ioby. 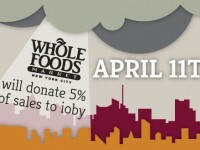 This Thursday, 5% of sales from NYC Whole Foods will be donated to ioby! This Thursday, 5% of sales from Whole Foods in NYC will be donated to ioby. When you shop at a Whole Foods store on April 11, you are helping ioby to support the innovators across the country that are making our neighborhoods stronger and more sustainable. At ioby, we are particularly excited about this day because, well, we love food. 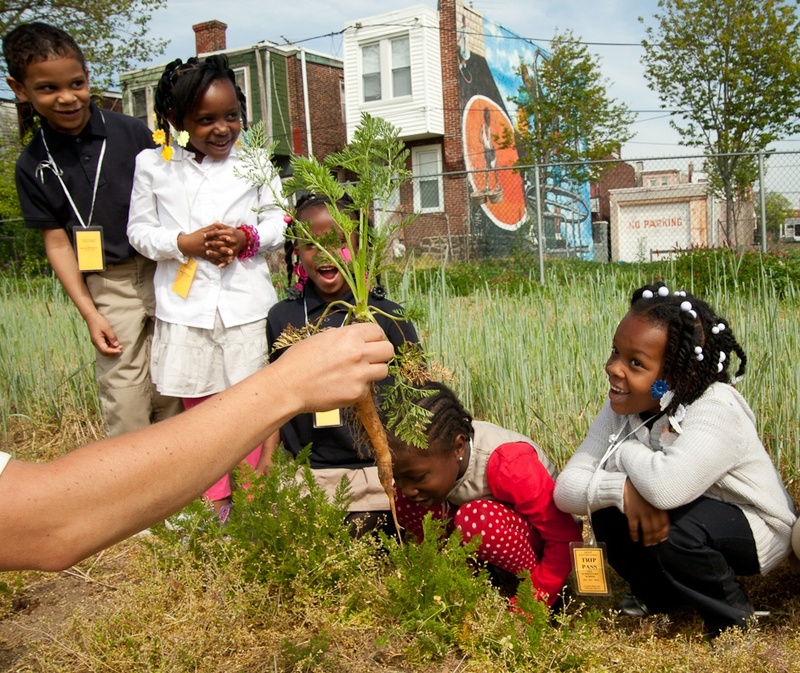 We see so many leaders and innovators creating stronger food systems, neighborhood by neighborhood. This is especially important in cities where access to healthy and affordable food can be limited. And there are two ways that you can help! Help us to spread the word far and wide! Even if you don’t live in NYC, please take 2 seconds to use Facebook or Twitter to show your support. Shop at Whole Foods on April 11! Whether you need to stock your fridge or get ingredients for a dinner party, set your sights on April 11. We will have a table to share information about the work of leaders across the country. Come by and say hello! Thank you for helping ioby to support the innovators across the country that make our neighborhoods stronger and more sustainable! Will Smith is no longer the freshest thing to come out of West Philadelphia. Sorry. Had to. Since 2006, the Mill Creek Farm, founded by Johanna Rosen and Jade Walker, has been providing its local community with fresh, organic produce galore. Located between the major commercial corridors of Market Street and Lancaster Avenue, this formerly vacant lot has since been transformed into a burgeoning farm, teeming with fresh okra, beans, and bees. The Mill Creek Farm’s existence stemmed from the idea that everyone should have access to local, organic, culturally-relevant food. In an interview with ioby, Johanna Rosen states, “Taking this trashy overgrown lot and turning into something that’s productive for the neighborhood and providing food access where there are limited options is very critical.” The farm is in the midst of a food desert where the option to buy fresh, local, pesticide-free produce is extremely limited, or nonexistent. Walker and Rosen, already experienced in agriculture and education, wanted to extend their knowledge to the surrounding community. In a short documentary, below, about the Mill Creek Farm, Jade Walker talks about how the farm sprouted to life. She says, “We deserve the option to eat locally and to feed ourselves with food that we culturally want to be eating and that makes sense to us as far as recipes, as far as our family history, and that we also deserve to have the option to have food without pesticides.” And that’s exactly why the two farmstands of Mill Creek Farm offer affordable, below-market prices, and serve as the only ones in the area that accept Farmer’s Market Nutrition coupons and Supplemental Nutrition Assistance (SNAP) benefits. While the Mill Creek Farm has faced some challenges in securing the land for permanent use, it serves as a staple to the community for those who volunteer and benefit from the cheap, accessible produce. In The Mill Creek Farm documentary Walker explains, “I don’t think that people come out to our volunteer days and community work days or even just stop by in the neighborhood because everyone wants to grow up and be a farmer…people want to be a part of something bigger than themselves. It’s an intrinsic human need to be working with other people, and be outside, and be touching the earth, and I think that’s what’s so cool about the farm here.” With that kind of passion driving the volunteers and friends of The Mill Creek Farm, it does not seem that they will be going anywhere anytime soon, at least not without a fight from the people in the community who have benefited from the Mill Creek Farm team and its dedicated and thankful residents. With its seventh growing season in the works, the Mill Creek Farm is now looking to bring on two new staff members to help out with the prosperous farm, and help bring new ideas to the table. Its project on ioby has successfully raised $1800 and seeks to raise $8535 more. The money raised will also help to run its youth education program, and buy market supplies. With your help they can continue to provide healthy organic vegetables, fruits (and honey!) to local residents of West Philadelphia. Meet Vision. 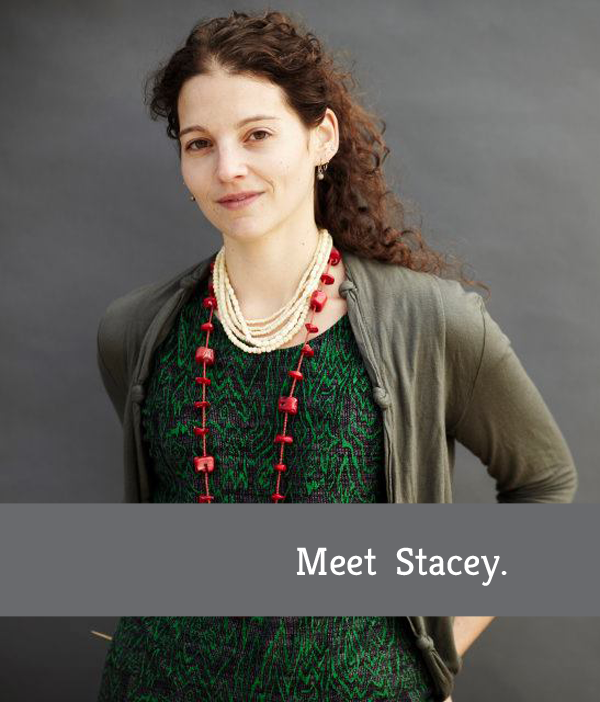 Meet Stacey Ornstein. My name is Stacey Ornstein, and I think I hold a lot of titles. I’m president of the Astoria CSA, or community supported agriculture. We connect our farm to the local community and we do a lot of educational programming, free to the community. In my professional life, I teach cooking to elementary school kids at an after-school program and through a couple of non-profits in the city. I’m originally from the Chicago area and I came to New York City, oh, a lot of years ago. I came to New York City to go to school and now I live in Astoria, Queens. So I’ve been here for about fourteen years now. Astoria is my favorite neighborhood. I do a culinary food tour as a little fun side project in Astoria. The tour that I do is a wider Mediterranean; we do Bosnian, Italian, Greek, and Egyptian, which I think is really cool because they’re some of the lesser-known ethnicities in Astoria. You have to love Queens for its ethnic diversity and food culture. I have my masters in education, and I worked on art education predominantly in my studies. When I graduated, I was working in a couple of art education non-profits. I worked with high school students, and I watched the foods that they were bringing in as snacks, and what they were calling their lunches, and it scared me. Growing up, I loved junk food. But when I started spending my own money on food and realizing that I wasn’t getting full off of that, I started making healthier food choices on my own. When I saw that kids were not doing the same, it scared me. That was my ‘Aha!’ moment. I love kids because they’re really not afraid to tell you what’s on their minds. They are really honest with you, and if they don’t like something or they think something is boring, they’re going to tell you or they literally go to sleep on the table in front of you. They’re much more likely to try good food when they know where it comes from, when they’ve had a hand in making it. Something green isn’t as scary when you pull it apart and understand its components. Beet gnocchi is really cool because it’s a hot pink fuchsia color. Kids love it because I talk to them about beets. If you can’t get your kid to eat beets, you tell them that they will pee pink and potentially miss school if they eat enough beets. Every kid will be chowing down on the beets. My favorite is anything that has a gross-out factor tagging along with it. I like working with yeast a lot, and doing breads, because they love the science of the yeast. They say they can hear it burping and see all of the gasses coming out. You sort of wish you had that child’s vision, watching bread rise, and being able to hear it burp. I was leading a green market tour for some fourth graders a couple years back. There was one student who told me he had never had an apple before, a fresh apple. That was a scary moment. It made me realize that things still need to be done. I’m obsessed with food, and there are so many foods that are all about New York. I support my farm in a winter share and a summer share, so I’m eating local about 90% of the time. Eating locally, there’s so many different ethnicities that you can play around with, and cook and eat. Mustard is an awesome, cross-cultural thing. In my community garden, we’ve got people from so many different countries who have different food memories associated with it. We have a Bangladeshi family who talks about having a mustard farm back in their home country. My grandmother was Latvian and she talks about making mustard, which is just vodka and mustard seeds, and maybe some horseradish for spice. However, once you add vodka and mustard seeds together, I don’t know if you need any extra spice. But it definitely clears your sinuses. Something that drives me everyday is hearing children’s attitudes change. In the beginning of the year, they see something green on the table and they pretend to convulse because they don’t want to eat the green thing. This week, we’re making a green soup with peas and asparagus and they think it’s awesome and they’re coming back for seconds and thirds. That definitely motivates me to keep going, when they’re no longer putting up a fight to eat something green. The connections that you can make working locally and when you get involved with a community are really amazing. You start to hear people’s stories and you really start to understand people. It makes the city seem smaller and more comfortable. I have this cantaloupe that was originally in some heirloom seeds that I bought. That cantaloupe crossed with another cantaloupe. It’s turned into the most amazing cantaloupe ever. Every year, I collect seeds from one of the cantaloupes. I take those seeds and packet them, and give some of these cantaloupe seeds to people in the garden. It’s really exciting to have something that you’ve created, pass it along to another gardener or another member of the community, and that they are then going to take the plant and sustain themselves with it. It’s an amazing cycle, saving the seeds and passing the seeds on. Allergic to Salad is my newer blog that chronicles my life working with elementary school kids, teaching them cooking. It came about because earlier in the year we were making something that involved spinach and green things, and I set out a platter of things that we were working on in class. So there was a lot of green stuff that we were working with, and I had a student who convulsed on the floor and said that she was allergic. I said, “You haven’t even eaten anything and you haven’t even touched anything.” And she stood up and said, “I’m allergic to salad, so I can’t eat anything today.” So I said to her, “I’m really disappointed, because next week we’re making a chocolate salad. Looks like you’ll have to sit that one out also.” She said, “Oh, no, I’m not allergic to salad anymore. Just this kind of salad.” So that’s where the name comes from, Allergic to Salad. It’s a combination of ‘Kids Say the Darndest Things’ and my life working with elementary school students. There was another instance where we were working with butternut squash and I talked about how butternut squash is like the brother to the pumpkin. As we started cutting up the squash, one of my students started crying because he said that we were killing the brother. But later he said that eating the brother was pretty good. I have some twisted kids, I guess, and that makes it more fun to cook. I hope one of my biggest contributions was helping to save my community garden, which was on the brink of being turned into—well, I don’t know what it was on the brink of being turned into. That was a scary moment. So, in my own community, that’s something that I’ve held onto and have made a connection with. There are so many amazing community gardeners and local activists around the city that are really inspiring. I think that all of those little projects are really inspiring when you hear about them and when they come to light. Every day, I’m re-inspired by people around the city when I hear some of the projects that people are working on. It’s not necessarily anything in the food world. Anything that really connects people to their community and to each other is amazing. That’s inspiring to me. 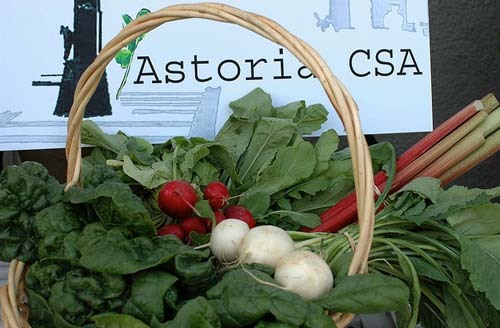 The Astoria CSA, formed in 2006, wants CSA shareholders to grab unfamiliar produce by the horns, and taste it. Veteran CSA members are likely familiar with the swap bin filled with the unwanted rutabagas and radishes. Instead of abandoning eggplant in the swap bin for safer, greener pastures, what if people were able to concoct fast, easy, and delicious recipes with vegetables they once feared or detested? This is the premise behind Food Extravaganza. The two words combined demand that every one of your senses be put to use, and invite you to wish up a few more. Food Extravaganza Demonstrations provide a way to familiarize CSA shareholders, and community members alike, with different types of vegetables and cuisines that most people may not necessarily feel comfortable handling. These demonstrations started in 2008, and usually happen once a month at the distribution point of the Astoria CSA at ARROW Community Center, located on 35th Street between 35th and 36th Avenue in southern Astoria. Stacey Ornstein—co-founder of Astoria CSA, food educator extraordinaire, and ioby project leader veteran—explained in an interview last week that the idea for Food Extravaganza Demonstrations stemmed from a desire to increase awareness of obesity, food diversity, and the subsidized shares the CSA offers to low-income families. Astoria CSA provides food demonstrations to encourage people to learn to cook something new, and to share recipes with those that might not have access to locally grown organic fruits and vegetables. Dalena Tonkin, Events Coordinator for Astoria CSA and Health Coach professional, shares her own favorite Food Extravaganza food with ioby exclaiming emphatically, “Through the CSA I have learned to appreciate something called a watermelon radish. They are the most brilliant hot pink shade of fuchsia on the inside, and they aren’t super spicy like radishes. They’re hot pink! You can’t go wrong with that!” It’s hard not to share Tonkin’s enthusiasm, and she hopes that others will learn to appreciate organic, local food the same way she does. “Nothing beats organic and local…I think a bag of carrots goes a little bit further than a bag of Doritos,” Tonkin insists. We at ioby could not agree more. With an ever increasing obesity rate in this country, and the disconnect between people and food, Food Extravaganzas provide a way to come together and learn about new recipes, different cultures, and cuisine varieties. It serves as a means to show others your favorite dish, and the hope that your new favorite, must-have food is waiting just around the corner. Ornstein and Tonkin are hopeful for the CSA’s project on ioby that aims to raise $255 before mid-June, when they plan to start the demonstrations. With Food Extravaganza Demonstrations, “people discover new foods and new ways to prepare their foods. I think that’s one of the great things that people enjoy about Food Extravaganzas. It’s having that knowledge of how things should taste and look. It’s not scary! It’s easy! And fast! And good!” Ornstein passionately tells ioby. Looking forward to the upcoming summer share, Tonkin hopes to have a vermiculture composting workshop with ioby’s very own Helen Ho. The CSA is also planning a series of farm trips throughout the season, and hopefully some canning sessions sprinkled in between. Tonkin hints that there is an Astoria CSA Cookbook in the works, so keep your ear to the ground, fellow veggie lovers! Food Extravaganza Demonstrations are an integral part of the Astoria CSA, and there is much and more to be learned by attending these amazing cooking demos. This project can be found on the ioby website, and while registration is closed for the spring, be sure to look for new member sign up in the fall. I would not hesitate to join, as spots seem to go as quickly as they open. Who knows? When Food Extravaganza Demonstrations is fully funded on ioby, and up and running, you may even find yourself leading a cooking demonstration yourself. Again, you can find the project here.